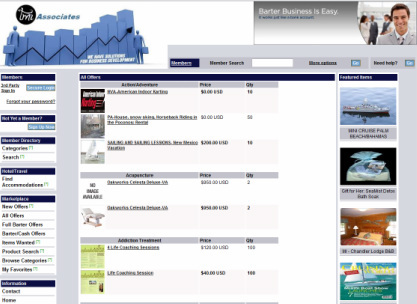 (Welcome to the BarterLoot world of online trading! At our Virtual trade & barter Marketplace Mall, you can list products and/or services, as well as purchase items from a large and diverse list of availability. * Our market place works similarly to other online markets, such as Amazon & eBay, where you can actually shop, sell, or buy with the entire transaction completed instantaneously online. Click Here to visit our Marketplace Mall Now! * - Only New TMI Accounting Clients may use barter. ** - Barter up to $250.00 limit per New Client, per yea,r for tax return work only.